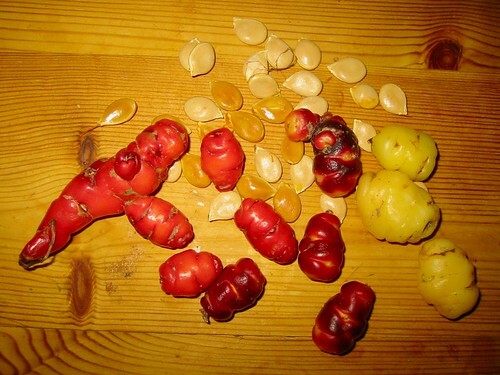 Oca tubers and squash seeds. Just like last year, we arrived a couple of weeks too late to harvest the oca and ulluco before the hard frosts came. As a result, there is almost no ulluco - so nothing for swaps this year unless I have already made you a promise and not a lot of oca either. I have reserved enough to secure a new planting for next year but to be honest I'm beginning to wonder if it's all worth it. I love the novelty of these plants but the main reason for my gardening is to provide food for the family. There is almost never enough crop from these tubers to provide one square meal to justify their space and trouble in the vegetable plot. I think I'll give it one more go this year, with extra mulches and fleeces and if that fails, they may just fall by the wayside for failing to make the grade, if that isn't mixing a metaphor too far. I'm also going to give Chinese Artichokes (crosnes, Stachys affinis) another go after finding a tub of them in the supermarket but my hopes aren't high. The last time we grew them the plants were fine but the ground was too wet and heavy and there were no tubers, just a few thickened bits of root that had come to nothing. The plants, which are considered perennials, failed after the first year. The plan is to use part of the newly recovered herb garden with extra sand and grit to improve drainage for these members of the mint family and hope for the best. Not a terribly optimistic first post for the year but come back soon as I hope to have more exciting news about other plans for the farm this summer. we had the same experience with our ones - although i think i dug them up too early! i am going to focus on things i know will work this year - we have such a tiny space i need to maximise its output. one thing i am giong to do is build a pergola and grow squash up it - if i can't go out i will go up! it wasn't that our total yield would have been too poor, more that I mistimed the harvest badly and the tubers were destroyed by the very cold weather we had over xmas. However, I'll try mixing them with the toms this year and see how it goes. Cheers.